One year and one month ago, I emailed Coach Cane and declared my desire to do triathlon. 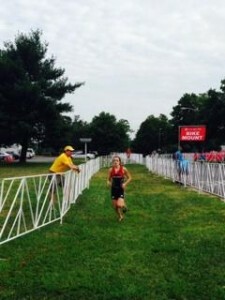 One week and two days ago, I competed in my first Olympic distance triathlon, the NJ State Triathlon. I have a few things to show for it, besides some soreness, blisters, and a skill for drawing parallels between time passing. I drove out Herb, my boyfriend/race photographer/personal cheerleader/gear assistant to West Windsor, NJ on Saturday afternoon to pick up my race packet from the expo. When we had the option for vanity bibs, I got really excited. But apparently "Cole" in size 8 font isn't big enough for spectators! Running low on gas as I approached my destination, I hoped it was not foreshadowing for my race! I did a walkthrough of transition, which was slightly different from others I've done, with 3 exits and entrances. I attended the pre race meeting to get intel about the water temperature, which is historically very high, one year topping 90 degrees. The water temperature was 80 degrees that morning for the sprint distance race but it had dropped from 86 the day before. This lake was more temperamental than a Real Housewife of New Jersey! The race officials said they planned to take the water temperature at 6am on race day. Spoiler Alert: the Water temperature dipped to a half degree below wetsuit-legal temps! Fast forward to race day, past the part where I thought I'd have to make a 6am trip to ShopRite for Gatorade (the hotel had some!) and worried if there were snapping turtles in the lake (never found that one out, but I didn't encounter one either). Parking for the event was easy peasy and I had plenty of time to set up transition and jog to the starting line, where my boyfriend was waiting for me to take my running shoes and keep me calm before the race started. Pre-race chatter and chest hair. I always love the pre race chatter that occurs on beaches before triathlons begin. Those who came to spectate can hang with you and mitigate the pre-race anxiety that rises with each wave starting the race. I had my wetsuit on; the announcement that morning was that the water had just barely dipped low enough for a wetsuit legal race. I swam for a few minutes in the swim warmup area, stopping when the national anthem played. I noted for a moment the juxtaposition of my gentle bobbing and a sea of unmoving multicolored caps, the stoic respect for the anthem and proceeding splashing and racing of bodies through the water. 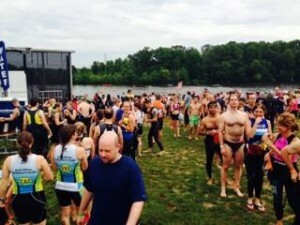 I lined up right at the front of the swim start, careful not to get stuck behind a wall of kicking legs. Once the countdown to my wave start reached 0, I carefully tucked in behind a girl for the first 200 meters, but just like every pint of ice cream I've ever purchased, she was suddenly gone! The dark water made it impossible to see anyone more than two inches from me, and I swear it camouflaged even the bubbles I seek out for drafting. With only buoys and no bodies in sight, I was on my own for the remainder of the race, save for a few silver caps I caught up to from the wave in front of me. I did a great job of sighting, even though I bear-hugged a buoy at one point. (The great thing about wrestling buoys is that they don't wrestle back!) The next marker I saw was 400 meters. I was shocked I was not even a third of the way through the swim. My triceps were burning. My biceps were tired. I kept pressing on, picking off a few silver caps (previous wave) and even a few yellow (my own wave) caps. In what felt like many buoys later, I made the final right turn back to shore and jetted out of the lake and up the mound for the first transition. The bike course was 2 loops on flat, fast roads. The second loop was a little more congested than the first, but there were very few times that I had to slow down for safety. After the first loop and PowerBar baby food (better than the official name, PowerBar Performance Energy Blends, which sounds like it could be a mix of Red Bull, a SoBe Ginseng drink, and coffee), I realized I had been breathing harder in the swim, would breathe harder on the run, and could hold a faster pace. I kept telling myself "I can hold this" that I got from NSQ, and it really helped me increase and maintain my pace. The second loop went by much faster, and I pulled into transition again. I set off on the run, which was described as a trail through woods. I thought, "Trail?! Like in cross country?! ", but it was a paved path through woods. Most of the run course was on paved paths. Fine by me, as the small mounds and curvy path still reminded me of a cross country race. My first mile was a 6:23, then a 6:20, and I was at 5k before I knew it! The run course goes right through transition again, and I heard my boyfriend cheer for me before I went to the east side of the park. The second 5k went by really slowly, and I could start to feel blisters on the backs of my heels. The course was an out-and-back, and I could see the lead female finisher 400 meters from her finish, going in the opposite direction. I approached the mile 5 flag marker facing the opposite direction and convinced myself that it was possible the flag was supposed to be facing me! The first and final quarter miles are on grass. I loved that. I finally reached the turnaround point, took some race-provided Heed, repeated to myself "just get to Herb," and kept pushing, noticing that the blisters weren't getting any more painful. 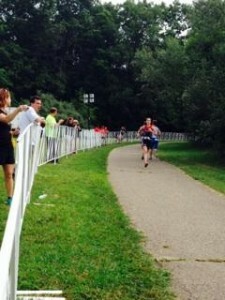 I had just over a mile until the finish. Honing in on those positives help me blast a 6:13 mile from miles 5 to 6. After mile 6, I emerged from the woods and into the finishing straightaway. I ran through the finishing chute, Julia Roberts red carpet style. The cheering of the paparazzi, I mean race volunteers, after the finish line gave me goosebumps. I accepted my finisher's medal, which was large and heavy enough to be flagged by airport security as a potential weapon. The race organizers give free race finishing pictures, which was ironically the only race picture I've seen that I'd pay for. One thing you don't see often is what I look like right after finishing. I treasure those first few seconds where you allow yourself to be still before filling with fear that you might cramp if you stay motionless for too long. The first thing to break me from my post-race vomit-stance was my boyfriend, running over to give me a huge hug! I entered the misting tent, which was more like a torture tent with my fresh blisters. I was one of the first finishers in the food tent (thank you, iron stomach), enjoyed watermelon, chicken, and soft pretzels, and chilled on the grass with Herb until it was time for awards. A medal heavier than my bike. I received my age group medal, which was even bigger than the finisher's medal. Anyone know alternate uses for medals? I think mine are made from iron and could be repurposed as a horseshoe, bookend, or necklace for a giraffe. My left hip adductor and right quad were sore for a few days, but the blisters were the most high-maintenance of my ailments. I drew some attention two days later when I was on a spin bike while wearing Toms, my only backless shoes. Fortunately, the race revealed that my swim was the discipline that needed the most work, and blisters prefer water to sneakers. I now have just under two weeks to prepare for the focus race of the season, USAT Age Group National Championships on August 9th in Milwaukee, Wisconsin. I'll be bringing Herb, my "I can hold this" mantra, more triathlon-friendly running shoes, but I'll be sure to leave the blisters and medals at home.